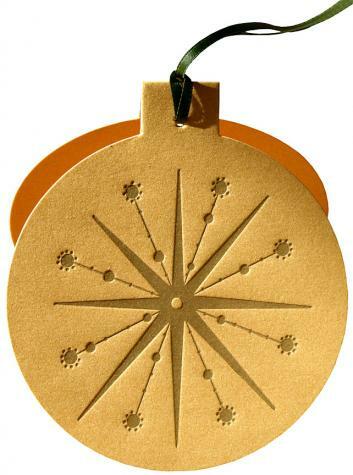 Gold on Gold Hanging Ornament Holiday Card -- diecut to replicate a Christmas Tree Ornament. Gold colored Italian pearlescent (not metalic) cardstock letterpress printed in Antique Gold Ink. Hangs OR stands upright on table. Fits perfectly into A2 envelope(included). Bi-Fold Diecut Holiday Ornament Card with ribbon hanger. Also stands upright. We can print your sentiment LETTERPRESS ONLY on inside . Or you can handwrite your holiday message. Comes with Italian pearlescent Champagne A2 (5.5x4.25 inches) heavy envelope. This Holiday Card can ONLY be printed Letterpress. No desktop printing.